We went to get our marriage license and The-Guy-Who-Knows-A-Song-About-A-Chicken was born in Washington DC. It turns out that these two facts are not necessarily compatible. The form for a marriage license requires your birth city, county, and state. The-Guy didn't have anything to put down for two out of the three blanks, and it made the clerk upset. She was doubtful of his claim that Washington DC is not part of any county or state. As The-Guy started to give her the full explanation of how Washington DC differs from other cities in the United States, I could see the look on her face change from one of confusion to something closer to mistrust or outright suspicion. "Oh no!" I thought, "What if she gets defensive about her lack of political knowledge and doesn't let us get married?!?!?!" Because by this time The-Guy, possibly from nervousness but more likely because of a true wish to inform, had moved into a full explanation of Washington DC's lack of representation in congress. My fears were ungrounded, however, as she decided the best course of action was to call the Texas state capital and make sure that people from Washington DC were, in fact, allowed to get married. And then we raised up our right hands and took some oath and she pronounced us practically just about married or ready to get really married or something like that and it was all very happy and official. 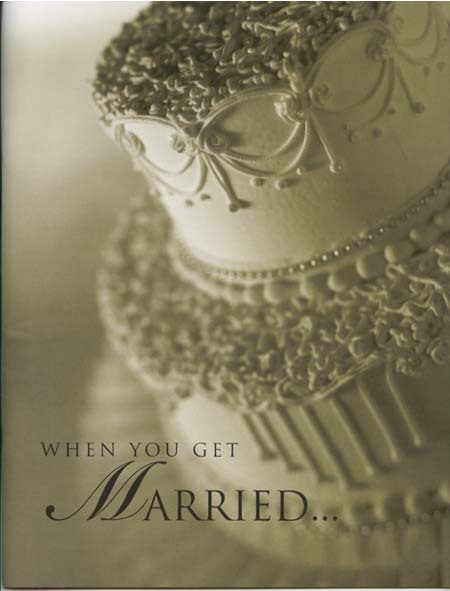 AND she gave us a booklet on being married published by none other than the Attorney General of Texas which is the exact person I always think of going to for marital advice... The booklet is full of sterile yet helpful information. For example, "Knowing what your spouse wants is only half the story. You also must know how to provide it to him or her." and "If you have not had a conflict yet, sooner or later you will." and "Arrange to spend time together on a regular basis." Now that we've read the booklet, I'm pretty sure a successful marriage is practically guaranteed. I feel bad for all those poor suckers who got married before this booklet was published. And also, I'm really glad we were both born here in the United States. Because if being born in Washington DC caused that much trouble, can you imagine how badly being born outside of the country would mess with the paperwork?!?!? I am thinking maybe I need to borrow that booklet, lord knows I want to guarantee success in my marriage too! Laughing out loud about your description of the book! Can't believe they hired someone as daft as the woman who didn't have a clue about Washington DC. Heck, I've only lived in this country for five years, and even I KNEW THAT. I guess it's true. The world really is being run by "C" students. What an ordeal!!! That book must have been a lifesaver. I'm worried that when I get married we won't make it for lake of a pamphlet from the Attorney General of Texas. Lame. As for the book I may need to borrow it. After 22 years of marriage, hubby and I have yet to read a book on how we are suppose to do this LOL. Just imagine if she had been a software bot that prints out the licence even your guy couldn't have convinced her. She would have been all "Some required fields (marked in red) are blank. Please try again." Now I'm wondering what they'll call Pentagon City in five years, let alone 'allow' them to come out and marry to prevent inbreeding. Oh man. I wish someone had provided me with that booklet, as I'm sure it would have saved much arguing. Love it. That's a wedding keepsake that will keep you chuckling for a good long while. lol Congrats on your upcoming (very successful!) wedding and marriage! Marlene - I knew it too, surprisingly enough! Disa - Yes, you probably should show up with full ammunition, all things considered. Maybe the booklet was the wedding present? Tracy & RachH - It turns out that you're in luck, because I found out that it's online!!!! SJ - Yeah, we should count ourselves really lucky that we were dealing with a real, live human. John C. - I hadn't realized! Curly Glamor Girlie - Yeah, I think they're going to have to start distributing it more widely than just Texas. Slyde - I guess we'll have to find out from Disa!